Nurit Page, head of the excavations in the area under the auspices of the Israel Antiquities Authority said that the city's bishop was known in Christian scriptures as someone who was extremely influential in the development of Christianity as a religion. 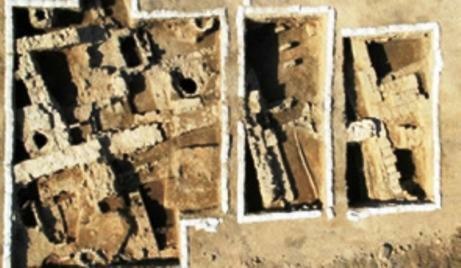 This discovery is the first concrete proof of Acre's role in early Christianity. "This is an important discovery for the study of Acre," Page said, adding that it is of particular significance "considering no remnants from the Byzantine Period had been found other than living quarters near the [Mediterranean] sea." The Antiquities Authority says that the size of the building and its impressive style show that this was a public building that was used in the bishop's city of Acre during the Byzantine Period. Archaeologists have pointed to other indicators that the excavations are in fact of Christian origin, including the roofing tiles used on the structure, the bits of ornate marble and the shards and rings they found nearby. Underneath the walls archaeologists have found clay pipes and one of the rooms has a mosaic floor. The building received its water supply from a nearby well. Acre during the Byzantine Empire is mentioned on multiple occasions in Christian scriptures. Bishops from both Acre and Caesarea were said to have participated in international conferences focusing on the establishment of core Christian principles. Their participation in these formative gatherings is testimony to the centrality of Acre in Christianity of the time. An anonymous Italian pilgrim wrote of the wealth and beauty of Acre in the year 570, praising the beautiful monasteries in the city. The majority of the Byzantine antiquities unearthed in Acre until this breakthrough can be traced back to the destruction that took place when the Muslim Arabs conquered the area during the seventh century. Beneath the foundation of the newly discovered church, archaeologists found earlier structures from the Hellenistic Period, holding imported vessels from the Mediterranean Basin. They found amphoras which they have determined to be from the Island of Rhodes based on their imprinted with the names of the Greek island's leaders.